A University website isnâ€™t really a single website. Itâ€™s actually made up of many sites: Human Resources. Office of the President. Department of Zebra Fish Studies. So the question is this: how important is it for these websites to be look the same? This recently became a topic on several forums and in our office. 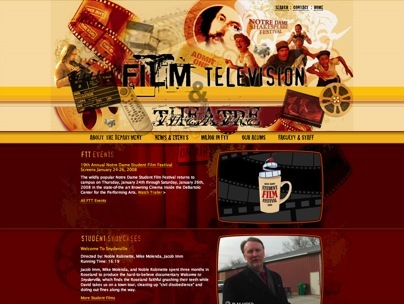 On EduStyle and other sites, people commented about how our Department of Film, Television, and Theatre didnâ€™t look anything like our other sites â€“ or even a Notre Dame website. After kicking these ideas around for a few weeks, I figured Iâ€™d jot down a few observations here. Someone proposed a compromise. Administrative offices would get a standard design, intended to be functional and carry the University brand. Academic units â€“ colleges, departments, institutes, and centers â€“ would be offered custom designs. However, there should still be some consistency in brand locations, navigation, etc. As users adapt to the website theyâ€™re on, moving to another ND site shouldnâ€™t be totally disruptive. They shouldnâ€™t need to learn a new interface and struggle to find the information they need. Iâ€™ve always been a proponent of custom design, but I can see the value of such a compromise. It would let our small group focus on more of the brand-critical, high visibility websites. personally i think its important for most sections of the website to look the same! I’m starting to agree with you. We’ve always treated each department website as an entirely separate website. But that doesn’t mean we should set our brand up to compete against itself.